By signing this agreement, all members agree to accept the terms contained within. The Protein Data Bank (PDB) is a worldwide resource. At present, data are deposited and processed by three groups: the PDB managed by the Research Collaboratory for Structural Bioinformatics (RCSB), the Macromolecular Structure Database (MSD) group at the European Bioinformatics Institute (EBI) and the Protein Data Bank Japan (PDBj) group at the Institute for Protein Research in Osaka University. All processed data are sent to the RCSB who oversee the process and distribute the data worldwide. It is essential for the progress of global science that the PDB data is maintained as a single archive of PDB data and is kept freely and publicly available. The three groups are fully committed to this principle. They also acknowledge the importance of global equality in the ability to deposit and access data and the need to have true international involvement and collaboration in maintaining the PDB. The Worldwide Protein Data Bank (wwPDB) has been created to provide an organizational structure whose purpose is to uphold these principles. The founding members of the wwPDB are the PDB managed by the Research Collaboratory for Structural Bioinformatics (RCSB), the Macromolecular Structure Database (MSD) group at the European Bioinformatics Institute (EBI) and the Protein Data Bank Japan (PDBj) group at the Institute for Protein Research in Osaka University. All three organizations serve as deposition, data processing and distribution sites. Proposals for new members would be reviewed by the current membership starting two years after the official establishment of wwPDB. Questions about adherence to the guidelines set forth in Section 4 will be discussed at the yearly meetings of wwPDB as described in section 6.5. Serious violations by a member will be considered by the wwPDB as the basis for withdrawal of that site from membership. The PDB exchange dictionary describes the syntax and semantics of PDB data that are processed and exchanged. It is designed to provide consistency of data that are processed by different people in different organizations. The definitive exchange dictionary is kept at http://mmcif.pdb.org. The term 'PDB archive' does not refer to the web sites, browsers and database query engines that will continue to be developed by the various sites. Other data formats and delivery methods may be included in the PDB archive in the future after full discussion and agreement among members. New formats must follow the naming and description conventions of the PDB exchange dictionary. Software is not part of the wwPDB. The members agree to act as distribution sites of the PDB archive as defined in section 3.1 with identical mirror contents and subdirectory structure. The archive keeper will coordinate the distribution of PDB identifiers (currently the 4 letter codes) to all deposition sites. The use of identifiers by members of the wwPDB resembling PDB 4-letter codes for other purposes is prohibited. The four-letter code consists of a number (0-9) followed by 3 letters or numbers. Members of the scientific community will be informed of this guideline and asked to conform. Archival files in the PDB archive are distributed with the reserved conventional names, in the form pdb<entry_id>.ent where <entry_id> is a PDB 4-letter code, e.g. pdb1abc.ent, for PDB format entries; r<entry_id>sf.ent, e.g. r1abcsf.ent for X-ray experimental data; <entry_id>.mr, e.g. 1abc.mr for NMR experimental/constraints, <entry_id>.cif, e.g. 1abc.cif for mmCIF format entries; and <entry_id>.xml e.g. 1abc.xml for canonical XML format entries. These file name conventions are to identify archival PDB entries and should not be used for other purposes. The 'archive keeper' has sole write access to the PDB exchange dictionary. All changes or modifications of the PDB exchange dictionary will be agreed upon by the members and will be reflected in the version number of the dictionary. The legacy PDB format will not be modified unless there is a compelling reason to do so. If that occurs the nature of the change will have to be agreed upon by all members of wwPDB and with 90 days notice to the community. All members of wwPDB will keep all format documentation publicly available. Data files containing PDB content may incorporate the PDB 4-letter entry name (e.g. 1ABC) in standard PDB records only if they are exactly the same as what is residing in the PDB archive. This does not prevent databases from including PDB entry_id's as cross-references where it is clear that they refer to the PDB archive. PDB records refer to the standard PDB format. The distribution of modified PDB format data including the records: HEADER, CAVEAT, REVDAT, SPRSDE, DBREF, SEQADV, and MODRES are not allowed. The distribution of modified PDB data in mmCIF format including categories in the dictionary category groups DATABASE and AUDIT is prohibited. The data dictionary for canonical XML (i.e. the XML schema currently http://pdbml.pdb.org/schema/pdbx.xsd) will be electronically translated from the PDB exchange dictionary. Changes in the schema will automatically track changes in the exchange dictionary. In addition to the canonical XML representation, XML data may also be delivered in a content consistent form in which the coordinate records are presented as single record rather than in the fully marked-up canonical form. The schema with abbreviated coordinate records is currently at http://pdbml.pdb.org/schema/pdbx-ext.xsd. XML data files with abbreviated coordinate records will be identified as <entry_id>-alt.xml, e.g. 1abc-alt.xml. wwPDB members are encouraged to develop their own web sites and views of the data. They may create full or partial mirrors of their sites. These mirrors must, however, adhere to the guidelines set forth in this document. 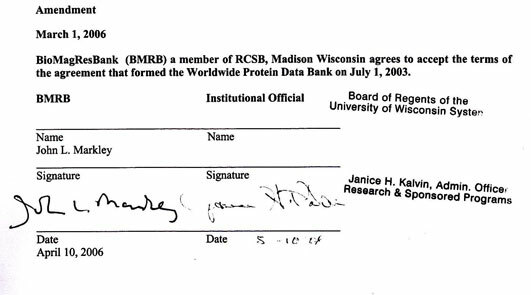 The founding members of wwPDB agree that the RCSB will act as the archive keeper as defined in section 4. If any member becomes unable to fulfill its agreed role as described in this document, then a new agreement must be reached. This will be done at the annual wwPDB meeting (section 6.5). All members of the wwPDB will make every attempt to adhere immediately to the guidelines that have been laid out in section 4 of this agreement. Any current practice that is in violation of the guidelines will be eliminated no later than six months from the signing of this document. 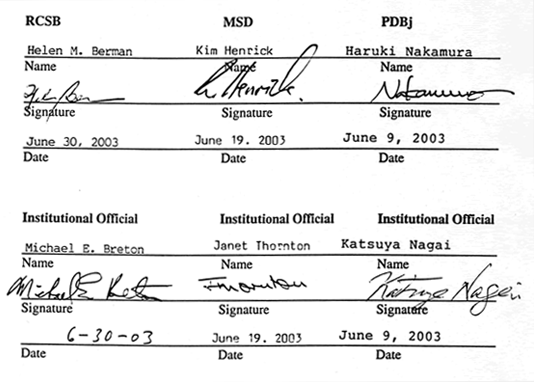 Each member organization of wwPDB agrees to the terms set forth in this document as attested to by their signature. A new web site for wwPDB will be created by the archive keeper. This site will contain two headings: the definition and scope of the wwPDB; and pointers to the three sites. All members of the wwPDB will agree upon the contents of this site. Any products created by each of the sites must be under the heading of that site logo. Each site will include a mission statement that describes the scope of their site and the search functions that they are providing. An Advisory Board will be constituted whose role will be to review policy issues and adherence to the guidelines of the wwPDB. It will also serve as a forum for dispute resolution. Each member of wwPDB will appoint two members to the Advisory Board. wwPDB will ask the International Union of Crystallography (IUCr) and the International Council on Magnetic Resonance in Biological Systems (ICMRBS) each to appoint one representative to the Advisory Board. The wwPDB members may seek advice from their own oversight committees, advisory boards and funding agencies as to the best representation of their site. The wwPDB will have a yearly meeting at a site determined by the membership. Alternation of meeting sites is strongly encouraged. The meeting will be attended by two representatives of each member of wwPDB and members of the Advisory Board. The funding of the meeting will be shared equitably among the three founding members of wwPDB. Prior to each annual meeting the members of wwPDB will agree upon the plans for sharing expenses and who will be invited as observers of the meeting. The initial term of this agreement will, assuming no review, be 10 years. After 5 years any partner may request review of the agreement and production of a "renewal agreement". If unreviewed at 9 years, the agreement shall in any case be reviewed and a renewal agreement produced. A 'renewal agreement' will come into force at the end of this agreement or one year after the finalization of its text - which ever is earlier. However, if all partners agree, a renewal agreement may come into force earlier, at any point after its finalization.